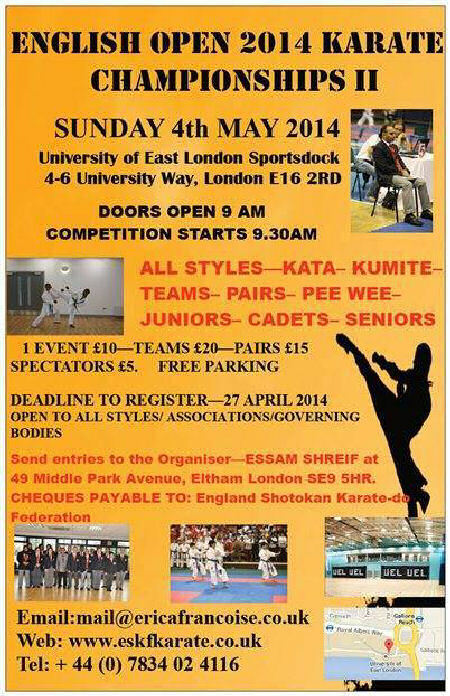 http://www.wukf-karate.org/upload/201308100926088.pdf with slight amendments as judged necessary by the organisers. 5 Tatamis will be used throughout the day. Area set-up will be provided in the coaches' packs on registration on the day. All kata (individual, pairs and team) will be judged in 2 rounds. The Chief Referee on each area will inform competitors of the two rounds. Competitors may perform any 2 katas of their choice, and may repeat the kata in subsequent rounds. If the same 2 competitors tie twice, final decision will be taken by flag. Athletes can compete with their own coloured belts. There may be amalgamations of categories if there are not enough entries in the said events as per WUKF rules. Kindly note that in team and pairs kata, there will also be 2 rounds. Competitors may repeat their kata in each round. No Bunkai is required in the final. Any known style kata will be allowed for all grades - as per WUKF kata list (see below). Medals will be awarded for 1st, 2nd, 3rd & 4th places. Trophies will be awarded for pairs and team kata. PARTICIPATION CERTIFICATE WILL BE AWARDED TO EVERYONE ON THE DAY. These will be included in the coach pack. Rules based on WUKF. The Chief referee will be Sensei Sever Cucu, who will brief all coaches and referees before the competition with any changes made to WUKF rules. Red and White mitts are compulsory and must be the same colour as the belt. Gum shields are compulsory unless you are wearing a helmet (for 14 year olds and under). Helmets, chest guards (girls/ ladies) and groin guards are recommended but not compulsory. Every competitor must provide his/her own equipment, protection, belts etc..
Medals will be awarded for 1st, 2nd, 3rd & 4th places. Trophies will be awarded for teams. Competitors will wear a RED belt (AKA) & WHITE belt (SHIRO) to identify themselves during the kumite events. Foot protection is NOT allowed. The timing of the bouts will be the same as in the WUKF rules, but can be subject to change, depending on the smooth running of events. You must be registered with a Club or Association to compete in these Championships. Entry forms must be signed by the official Association or Club Coach only. Entry forms without a signed declaration will not be accepted. The competition will start at 9.30am with Individual kata, followed by team/Pairs kata, then individual kumite followed by team kumite. Children will be starting first starting with the youngest. there will be a coaches and referees meeting at 9am hosted by Sensei Sever Cucu. The minimum number of competitors per event category and the cancellation of events is at the discretion of the organisers. and must reach the organisers by 27th April 2014. NO LATE ENTRIES ON THE DAY. All Clubs/Organisations are asked to provide one or more referees/judges whose names must be entered on the entry form. They will be given free lunch and refreshments on the day. All coaches will be issued with a coach badge. Please let us know how many coaches you will be bringing to the competition so we can include the badges in your coach pack. Only the official coach (with a badge) may approach the control table for any queries. Competitors and spectators MUST go via their coach for information. Spectators' entry fees for the day is £5 per person and free for children under 5 years old. Every competitor will be issued with a Participation certificate which will be included in the coach pack. First Aid will be provided on the day. All competitors must be fully insured by their association and must have their licenses on hand to be checked if required. ALL FEDERATIONS AND GROUPS ARE WELCOME. WE HAVE NO RESTRICTIONS ON YOUR AFFILIATIONS. Check website www.eskf-karate.co.uk for possible updates . * Please check the website as we may close earlier if we reach capacity. the premises at which the Championship are being held"
I confirm that all the competitors entered on this sheet have received my advice , and accept the following statement: "The competitor realises and discharges the organisers and their representatives or agents and other competitors from all claims that the competitor or their personal representative may have for any injury (however caused) sustained by the competitor and for the loss or damage to personal belongings at any time during the course of the Competition or while on the premises at which the Competition is being held".